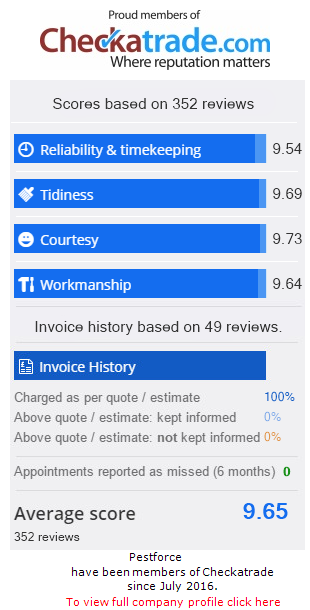 Pestforce Chiswick is rated 4.8 out of 5 based on 7 customer reviews. I’m Sean Banks and I am the owner and Senior Technician and have a close knit team of highly skilled Pest Controllers at Pestforce Chiswick. If you have a pest problem – or think you may have a pest problem – then call me or a member of my team and get not only one of the best pest control services in the area, but great advice too! We are local to you and can be with you same day when necessary. We have recently gained the rare feat of a Distinction in my BPCA/RSPH Level 2 making us one of the best qualifed Pest Controllers around. We service all W & SW postcode areas including the Chiswick London. Rats – a massive problems in all areas, not just the Chiswick. The way we live, the rubbish that is a welcome food source to rats, all contribute to their numbers swelling. Prolific breeders, their numbers can swell within weeks! But, as well as being a nuisance they also carry a bacteria that when humans come into contact with it, can make us very ill.
Pestforce were called out to help restore and protect some newly fitted solar panels recently, the pigeons had started to nest under the panels and foul all over them and the gardens below. We carefully removed and dispatched the offending birds humanely, then proceeded to clear all nesting materials and guano (pigeon poo) using a specialist biocide to neutralise bacteria and pathogens associated with the birds. The solar panel system void was then sealed using a specialist purpose made solar panel proofing system. The proofing system includes mesh and fixings that have been manufactured to stop birds from breaching and gaining access to the solar panel void, ensuring they are protected from the damage birds cause. The finished product looks great and the customer is over the moon with the outcome of the installation. A job well done! Prompt reply to request. Good communication able to attend at my convenience. Great service. I just wanted to say a huge thank you for all your help. I could not fault the service you provided and would recommend your company to all. Both of you were totally professional and really helpful. "A big thank you to Mark and Sean for all their help getting rid of the mice in my flat. I would strongly recommend this company to anyone who is looking for a Pest Control firm to troubleshoot effectively, deal efficiently with the problem, and provide a reliable service throughout. These guys are highly knowledgeable about a wide range of pests and Pest Control, with long experience of dealing with all sorts of pest infestations. What really makes them stand out from all the other companies, though, is their personalized approach to each case and their first-rate customer care skills. I was really unnerved by the mice episode, but Mark was sensitive to that and reassured me he was going to use a variety of methods to prevent the mice from returning. He then proceeded to explain exactly what he was going to do at each step of the way, and made sure that I knew I could get in touch with the company if there was a recurrence. He was respectful of my space, careful in my home, and double-checked to make sure there was absolutely nowhere left for the mice to breach the defenses. Sean was equally reassuring on the telephone and managed to squeeze in an appointment for me when the team were already pushed because he realized I was panicky and didn't want to go through another night with mice in the flat. When there was an unavoidable (minor) delay in arrival-time for the second appointment, Sean phoned to let me know an anticipated time of arrival. Again, a small thing, but it made a big difference in terms of how valued I felt as a customer. I felt like I was in safe hands and knew I could rely on this team to sort the problem out". Excellent customer care; a friendly, reliable and honest service that I would definitely recommend to anyone in need of pest control!